This product is no longer available and has been replaced by: SC32B. 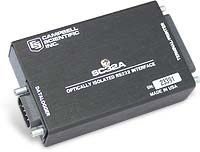 This optically-isolated RS-232 interface connected to the data logger's 9-pin CS I/O port via an SC12 or SC12R-6 cable. The SC32A converted the CMOS logic levels of the serial I/O port of a data logger to the RS-232 levels of a computer. It could support RS-232 cable lengths of up to 50 feet.